Nougat is now running on 11.5% of the Android devices out there. Compared to this time last year, Marshmallow was on 13.3% of phones and tablets. For the first few months of the year, Nougat adoption was tracking ahead of Marshmallow. Perhaps that was a bump from higher Pixel sales this year compared to Nexus phones last time. It's unclear. 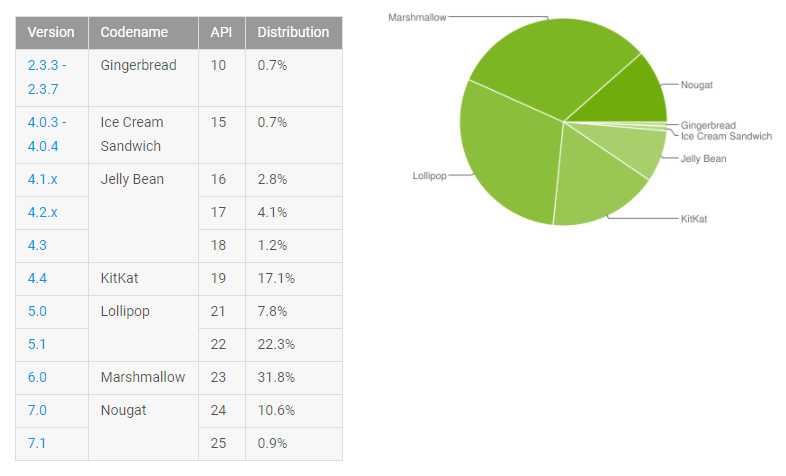 Marshmallow continues to be the largest segment of Android at 31.8%. The good news is that KitKat dropped a full point this month. It's still a big chunk of devices, but it's been falling fast. In a year it might be a negligibly small sliver of Android. Gingerbread also continues dropping (now at 0.7%) after its bizarre tenth of a point jump in May. A few more drops like this and it'll fall off the charts along with ICS.